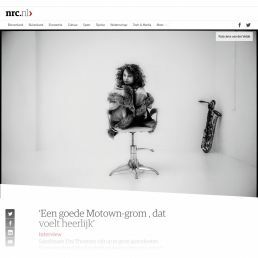 Due to the hectic days, you sometimes forget to post even the publication of Tini Thomsen XL photograph in Dutch newspaper NRC! Of all altsax players, Tini is definitively most Rock ’n Roll. You want to spring and dance when you hear the music of her and her band. Cinematic music moments to reset your mind and to wipe the sweat off your forehead complete the shows and of course her albums. This was my second album shoot for Tini Thomsen (born in Hamburg). Since the first shoot I encouraged her to express her beauty and show the energy of her music. A third shoot will take place soon!